There is no shortage of inexpensive red dot sights on the market. But when it comes to quality and performance, only a few expensive models can satisfy the most demanding buyers. If you are one of them, then our Leupold DeltaPoint Pro review may be for you. On it, we are going to showcase DeltaPoint Pro, a high-quality reflex sight that may be the best choice for you. Let’s see what it has to offer without further ado! Who the product is for? Lightweight and compact, DeltaPoint Pro is for buyers who don’t want to make their firearms much heavier, first of all. Secondly, as a rather expensive red dot sight, DeltaPoint Pro is built in very high quality. If you want an excellent sight no matter the money, then this one may be for you. 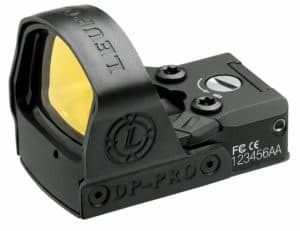 Leupold DeltaPoint Pro reflex dot sight is made in an open design. Thanks to this, it has several advantages over tube red dot sights, as well as disadvantages. The key advantages of DeltaPoint Pro as an open red dot sight is that it is very lightweight and compact. It can be definitely used with a variety of firearms – including pistols – without making them too heavy or bulky. In addition, it is very easy to take quick aim with this sight. On the other hand, what this open red dot sight doesn’t have is dust covers. Besides, its lens isn’t really made anti-reflective, so you may face some issues with it occasionally. The dot of this particular DeltaPoint Pro sight model is sized at 2.5 MOA, meaning that it will cover 2.5 inches of the target per every 100 yards. 2.5 MOA is rather small, so you should be able to use this sight pretty conveniently at longer ranges. On the other hand, the 2.5 MOA dot may be a bit small for shorter ranges. If you are mostly shooting at short range, then maybe you should opt for the 7.5 MOA version of this sight. Needless to say, this sight also has unlimited eye relief, so there won’t be any view angle limits with this sight at any distance. This small guy is very tightly built. First of all, its open lens has been made scratch-resistant, which is a mandatory thing for open red dot sights. The lens’ exterior surfaces are also made abrasion-resistant, so you could expect a lifetime of service from this sight’s lens. The body of the DeltaPoint Pro red dot sight is also made fog- and waterproof. Add to this the fact that this device is designed to work in -20F to +120F environments, and you get a sight that can be used pretty much anywhere. Its storage temperature range is even broader – from -40 to +160 degrees Fahrenheit. And yeah, the housing is made from lightweight aluminum that is shrouded in rugged spring steel, so this thing is also durable structurally. DeltaPoint Pro comes with a rubber cover, a couple of screws for firearm mounts, and a couple of keys for mounting. As you can see, no firearm mounts are included with this red dot sight, which is a big downside in our book. This sight is rather expensive as it is, and you’ll need to spend more money to get a mounting plate for it. One of the included keys is used to remove the rear metal cap of this sight, which exposes a dovetail mount. This allows you to mount Leupold’s optional iron sight to allow you to co-witness the reticle. This may be a good option for you if you can’t co-witness with your gun’s iron sight. Leupold covers their red dot sight by a lifetime warranty. It will allow you to replace or repair the scope free of charge without proof of ownership! Obviously, Leupold doesn’t cover damage caused by misuse or abuse. Leupold DeltaPoint Pro has 8 illumination settings for its dot. Thanks to this, you should be able to clearly see the dot regardless of light conditions. What we don’t really like about the illumination settings is how inconvenient their adjustment is. It is done via the sight’s power button located on the battery cap right behind the lens. By default, pressing the button will increase the intensity setting. To switch to decreasing, you need to press and hold the power button for 2 seconds and release it. Then, each push of the button will decrease the intensity setting. Sights with separate buttons are definitely more convenient when it comes to brightness adjustment. Leupold has probably implemented this system to save space on the sight. Another thing should also be mentioned. When pushing the button, your finger will block the view of the dot, so you won’t able to assess if the selected setting is good. You would need to remove your finger to see if the brightness is alright. The windage and elevation of DeltaPoint Pro sight can also be adjusted. Both are adjusted in 1 MOA increments within a 60 MOA range. This is rather good, though there are sights that have more accurate and broader settings. The last notable feature in DeltaPoint Pro is its 5-minute deactivation. Using the proprietary Motion Sensor Technology, the sight automatically switches its illumination off after 5 minutes of inactivity. And as soon as any movement is detected, the illumination is switched back on. Very easy to take quick aim. The 2.5 MOA dot is good for longer ranges. Durable thanks to abrasion-resistant coating. Covered by a lifetime warranty. Doesn’t come with any mounts. The dot gets blocked by your finger while adjusting its brightness, not allowing you to see how bright it is. With several downsides which may repel some people, DeltaPoint Pro isn’t perfect. However, if you can forgive it for the not so great ergonomics or the absence any mounting plates, then it may be the best red dot iron sight that you could get out there. What kind of a battery does this sight use? DeltaPoint Pro uses 3V CR2032 lithium batteries. These batteries are widely available on the market. Can DeltaPoint Pro co-witness with stock iron sights? It should be able to co-witness with most iron sights. Where do you find mounting plates for DeltaPoint Pro sight? Leupold offers mounting plates on their website. Mounting plates from other manufacturers should work with it as well. Author and administrator of the site, I have been passionate About hunting for years. I decided to create this site to share my knowledge and guide you to acquire the right hunting gear that you need to boost the performances. Zoomtargets.com is a participant in the Amazon Services LLC Associates Program, and we get a commission on purchases made through our links.